I recently mentioned that Alex Rodriguez will be making his acting debut in the movie “Friends with Benefits,” and filming has started with a bang. 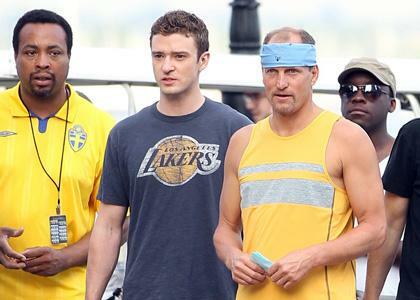 It appears that baseball won’t be the only sport included in the film, as co-stars Justin Timberlake and Woody Harrelson recently shot some scenes for the movie while on the basketball court. It appears that not every celebrity has converted their basketball fandom to the Miami Heat, although the Lakers bandwagon is just as loaded as ever. Harrelson did “Semi-Pro” with Will Ferrell a couple of years back, a satirical movie about the ABA’s demise. Hopefully his skills have improved since then.